Now, there are some modular adapters out there but they only work with a round 6 or 8 pin type connector, and those are specific to brands as it wasn’t standardized wiring. 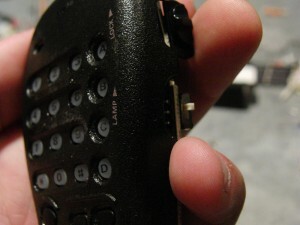 This method installs a standard 3.5mm plug to the Handset so that any microphone can be installed. Originally, I was going to put on a 2.5mm jack specifically for the size needed by headsets but as I worked and spliced the cable I found the wires to be too small to work with, and of the bizarre audio colored strand that I have no idea how to solder. Also, with a 3.5 it’s a more standard size and maybe I’ll use another mic at some point for who knows what. Below is the Build Log, I made all decisions and design On the Fly, as this was a spur of the moment project using only supplies on-hand. All in all, from time first taken the thing apart to having tested the mod, found problems, and fixed it I think I spent about an hour. 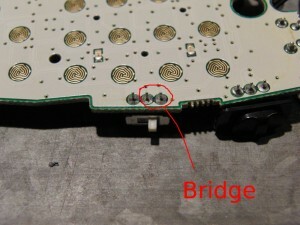 Here is the back of the PCB of the hand microphone, it will be where most of the work is done. I originally planned on just taking out the connector on the bottom and making a cable that attached to that as I do not have a proper crimp tool to make a modular cable, and I always HATE splicing in-line on a cable unless I have some hard connector or box in between and this would have made it easy. But, I wanted to keep my DTMF pad on the handset and have a backup microphone, so I went another route. This is what I decided to do: the image below shows the switch for the “Lamp” setting, which simply turns on the LED backlighting on my mic. I never turn the backlighting off so I found a point where I could install a port. 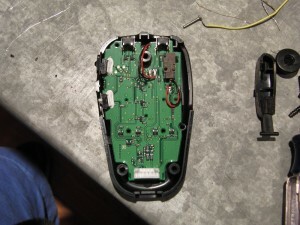 But then, having decided to still use the internal mic, I decided to rewire the switch to make it change between the microphones and solder the lamp contacts into a permanent ‘On” state. 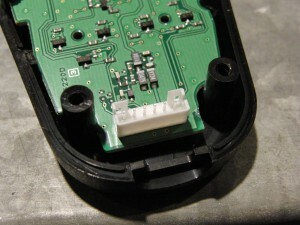 Unfortunately, even with with only trace solder remaining after desoldering, the switch decided to break rather than pull out so I used a different switch which unfortunately will not fit the old slider. Oh well. 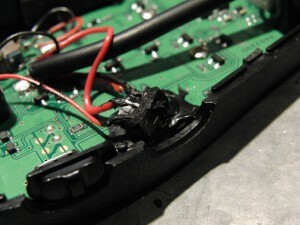 Also, after soldering and closing the case for the first time, the super glue on the switch was still drying and apparently the back of the case pulled enough on one wire to break it. 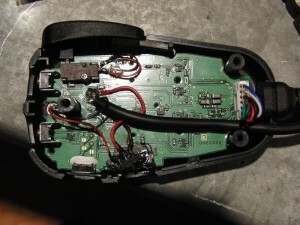 The wire was helping hold it in place by being soldered, so the switch went off alignment. No biggie, as it is still usable even though it is not the best looking thing in the world. just a note, the black stuff you see is Liquid Electrical Tape . A jar is $6, and it is one of the best investments I ever made. I used it to protect the old switch contacts from shorting as well as the new ones should a lead break. A top view of the installed cable. I drilled a small hole at the bottom near the main cable while the case was assembled to feed it out. 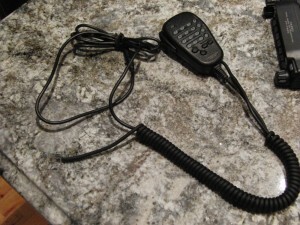 The finished cable, with the secondary microphone cable run through the coil for a cleaner look. I should have cut down the external cable to get rid of slack, but maybe it will prove useful to have left it long. I can always reterminate it later.